When I saw this simple graffiti, I had to stop and take a shot of it. Four words that say so much. Yes, ‘cowards’ is a really strong word. It works, though, when you consider that for most of us, greatness is a choice. We’re not 6 foot 4, 3% body fat natural-born athletes. We’re not musical prodigy with perfect pitch. For the majority of people, greatness is work. Hard work. Lots and lots of hard work. The good news is that work can be done by any of us if we just have the courage and the will to choose to do it. 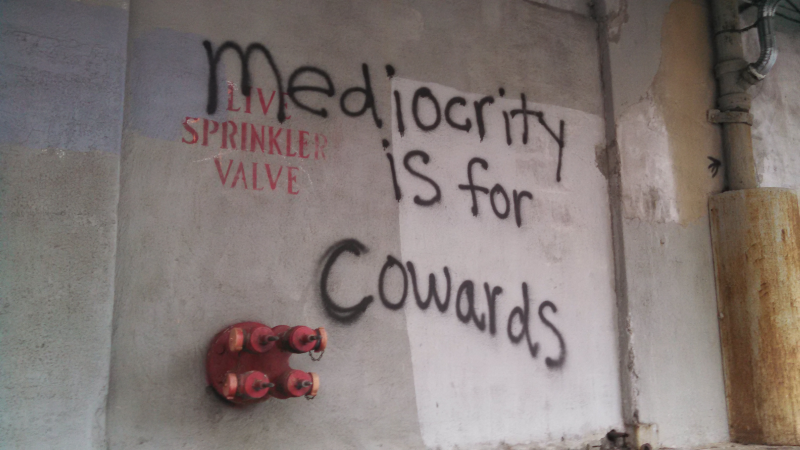 Mediocrity is for cowards. Be brave enough to create something great.